Like the 2015 original, this comedy plays merrily with cliches to tell a silly story that’s funny but never particularly clever. It’s an enjoyable bit of escapist entertainment, mixing some sharp gags in between the more obvious jokes. But while the script makes a feeble attempt to poke fun at over-the-top machismo, it indulges in relentless gender stereotyping. Now best buddies, co-dads Dusty and Brad (Mark Wahlberg and Will Ferrell) decide to combine their families to celebrate Christmas this year. Then Dusty’s estranged tough-guy dad Kurt (Mel Gibson) turns up, as does Brad’s more touchy-feely father Don (John Lithgow). This raises issues for both Dusty and Brad, who are clearly chips off the old blocks. They may be united in their love for their kids (Owen Vaccaro, Scarlett Estevez and Didi Costine), but old rivalries spark as they take the family to a huge mountain cabin with their wives (Alessandra Ambrosio and Linda Cardellini). What follows is a combination of wacky slapstick and various forms of sabotage as Dusty and Brad’s bromance is put through the wringer. None of this is remotely original, with elaborate set-pieces that feel like they’ve been lifted wholesale from other holiday comedies. And the plot is never remotely surprising either. But the actors have chemistry, and invest some sparkiness in their characters. Much of the antics centre on the clash between Gibson and Lithgow, who play up the aggression and sweetness, respectively. It’s badly exaggerated, but the actors throw themselves into the roles, and the interaction between the three generations is nutty enough to keep the audience chuckling even through some rather stupid gags. 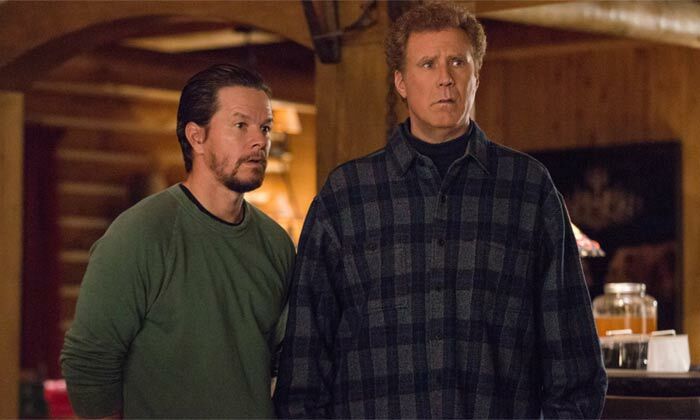 The filmmakers seem to think that crazed conflict is hilarious, but actually the funniest moments are when Walhberg and Ferrell are working together to approach a problem. As the mayhem escalates, the supporting players get a chance to chime in with various contrived subplots, all of which weave together into the energetic goofiness. Each actor adds some fun to the film, including John Cena as Ambrosio’s ex, who turns up later. It’s so amiable that we don’t even mind that director-cowriter Sean Anders can’t resist diving headlong into syrupy sentimentality along the way, brazenly exploiting Band Aid’s Do They Know It’s Christmas. So while there’s little here of note, at least this is a rare sequel that has a more refined sense of humour than the original. And it keeps us amused right through to the corny finale. But it’s utterly forgettable.